10 mg/100 mg, containing 10 mg of carbidopa and 100 mg of levodopa. 25 mg/100 mg, containing 25 mg of carbidopa and 100 mg of levodopa. 25 mg/250 mg, containing 25 mg of carbidopa and 250 mg of levodopa. 10 mg/100 mg — Corn starch, FD&C blue #2 aluminum lake, magnesium stearate, microcrystalline cellulose, and pregelatinized starch. 25 mg/100 mg — Corn starch, D&C yellow #10 aluminum lake, FD&C yellow #6 aluminum lake (sunset yellow lake), magnesium stearate, microcrystalline cellulose, and pregelatinized starch. 25 mg/250 mg — Corn starch, FD&C blue #2 aluminum lake, magnesium stearate, microcrystalline cellulose, and pregelatinized starch. The incidence of levodopa-induced nausea and vomiting is less with the combination product than with levodopa. In many patients, this reduction in nausea and vomiting will permit more rapid dosage titration. The plasma half-life of levodopa is about 50 minutes, without carbidopa. When carbidopa and levodopa are administered together, the half-life of levodopa is increased to about 1.5 hours. At steady state, the bioavailability of carbidopa from carbidopa and levodopa tablets is approximately 99% relative to the concomitant administration of carbidopa and levodopa. Pyridoxine hydrochloride (vitamin B6), in oral doses of 10 mg to 25 mg, may reverse the effects of levodopa by increasing the rate of aromatic amino acid decarboxylation. Carbidopa inhibits this action of pyridoxine; therefore, carbidopa and levodopa can be given to patients receiving supplemental pyridoxine (vitamin B6). 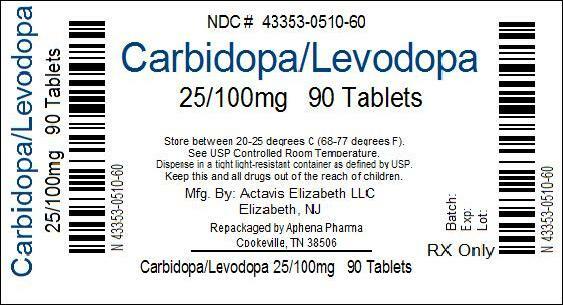 Carbidopa and levodopa tablets are indicated in the treatment of the symptoms of idiopathic Parkinson's disease (paralysis agitans), post-encephalitic parkinsonism, and symptomatic parkinsonism which may follow injury to the nervous system by carbon monoxide intoxication and/or manganese intoxication. This product is indicated in these conditions to permit the administration of lower doses of levodopa with reduced nausea and vomiting, with more rapid dosage titration, with a somewhat smoother response, and with supplemental pyridoxine (vitamin B6). In some patients a somewhat smoother antiparkinsonian effect results from therapy with carbidopa and levodopa than with levodopa. However, patients with markedly irregular ("on-off") responses to levodopa have not been shown to benefit from carbidopa and levodopa. Although the administration of carbidopa permits control of parkinsonism and Parkinson's disease with much lower doses of levodopa, there is no conclusive evidence at present that this is beneficial other than in reducing nausea and vomiting, permitting more rapid titration, and providing a somewhat smoother response to levodopa. Certain patients who responded poorly to levodopa have improved when carbidopa and levodopa was substituted. This is most likely due to decreased peripheral decarboxylation of levodopa which results from administration of carbidopa rather than to a primary effect of carbidopa on the nervous system. Carbidopa has not been shown to enhance the intrinsic efficacy of levodopa in parkinsonian syndromes. In considering whether to give this combination product to patients already on levodopa who have nausea and/or vomiting, the practitioner should be aware that, while many patients may be expected to improve, some do not. Since one cannot predict which patients are likely to improve, this can only be determined by a trial of therapy. It should be further noted that in controlled trials comparing carbidopa and levodopa with levodopa, about half of the patients with nausea and/or vomiting on levodopa improved spontaneously despite being retained on the same dose of levodopa during the controlled portion of the trial. Nonselective monoamine oxidase (MAO) inhibitors are contraindicated for use with carbidopa and levodopa. These inhibitors must be discontinued at least two weeks prior to initiating therapy with this combination product. Carbidopa and levodopa may be administered concomitantly with the manufacturer's recommended dose of an MAO inhibitor with selectivity for MAO type B (e.g., selegiline HCl) (See PRECAUTIONS, Drug Interactions). Carbidopa and levodopa is contraindicated in patients with known hypersensitivity to any component of this drug, and in patients with narrow-angle glaucoma. Because levodopa may activate a malignant melanoma, carbidopa and levodopa should not be used in patients with suspicious, undiagnosed skin lesions or a history of melanoma. When carbidopa and levodopa tablets are to be given to patients who are being treated with levodopa, levodopa must be discontinued at least twelve hours before therapy with the combination product is started. In order to reduce adverse reactions, it is necessary to individualize therapy. See DOSAGE AND ADMINISTRATION section before initiating therapy. The addition of carbidopa with levodopa in the form of this combination product reduces the peripheral effects (nausea, vomiting) due to decarboxylation of levodopa; however, carbidopa does not decrease the adverse reactions due to the central effects of levodopa. Because carbidopa permits more levodopa to reach the brain and more dopamine to be formed, certain adverse CNS effects, e.g., dyskinesias (involuntary movements), may occur at lower dosages and sooner with carbidopa and levodopa than with levodopa alone. Levodopa alone, as well as carbidopa and levodopa, is associated with dyskinesias. The occurrence of dyskinesias may require dosage reduction. As with levodopa, the combination product may cause mental disturbances. These reactions are thought to be due to increased brain dopamine following administration of levodopa. All patients should be observed carefully for the development of depression with concomitant suicidal tendencies. Patients with past or current psychoses should be treated with caution. Carbidopa and levodopa should be administered cautiously to patients with severe cardiovascular or pulmonary disease, bronchial asthma, renal, hepatic or endocrine disease. As with levodopa, care should be exercised in administering the combination product, to patients with a history of myocardial infarction who have residual atrial, nodal, or ventricular arrhythmias. In such patients, cardiac function should be monitored with particular care during the period of initial dosage adjustment, in a facility with provisions for intensive cardiac care. As with levodopa, treatment with the combination product may increase the possibility of upper gastrointestinal hemorrhage in patients with a history of peptic ulcer. Neuroleptic Malignant Syndrome (NMS): Sporadic cases of a symptom complex resembling NMS have been reported in association with dose reductions or withdrawal of therapy with carbidopa and levodopa. Therefore, patients should be observed carefully when the dosage of carbidopa and levodopa is reduced abruptly or discontinued, especially if the patient is receiving neuroleptics. Patients with chronic wide-angle glaucoma may be treated cautiously with carbidopa and levodopa provided the intraocular pressure is well-controlled and the patient is monitored carefully for changes in intraocular pressure during therapy. Dopaminergic agents, including levodopa, may be associated with somnolence and very rarely episodes of sudden onset of sleep. In some cases, these episodes may occur without awareness or warning during daily activities. Patients must be informed of this and advised to exercise caution while driving or operating machines while being treated with dopaminergic agents, including levodopa. Patients who have experienced somnolence and/or an episode of sudden sleep onset must refrain from driving or operating machines (see Information for Patients). Epidemiological studies have shown that patients with Parkinson’s disease have a higher risk (2- to approximately 6-fold higher) of developing melanoma than the general population. Whether the increased risk observed was due to Parkinson’s disease or other factors, such as drugs used to treat Parkinson’s disease, is unclear. For the reasons stated above, patients and providers are advised to monitor for melanomas frequently and on a regular basis when using carbidopa and levodopa for any indication. Ideally, periodic skin examinations should be performed by appropriately qualified individuals (e.g., dermatologists). The patient should be informed that this combination product is an immediate-release formulation of carbidopa and levodopa that is designed to begin release of ingredients within 30 minutes. It is important that carbidopa and levodopa be taken at regular intervals according to the schedule outlined by the physician. The patient should be cautioned not to change the prescribed dosage regimen and not to add any additional antiparkinson medications, including other carbidopa and levodopa preparations, without first consulting the physician. Patients should be advised that sometimes a 'wearing-off’ effect may occur at the end of the dosing interval. The physician should be notified if such response poses a problem to life style. Patients should be advised that occasionally, dark color (red, brown, or black) may appear in saliva, urine, or sweat after ingestion of carbidopa and levodopa. Although the color appears to be clinically insignificant, garments may become discolored. The patient should be advised that a change in diet to foods that are high in protein may delay the absorption of levodopa and may reduce the amount taken up in the circulation. Excessive acidity also delays stomach emptying, thus delaying the absorption of levodopa. Iron salts (such as in multi vitamin tablets) may also reduce the amount of levodopa available to the body. The above factors may reduce the clinical effectiveness of the levodopa or carbidopa and levodopa therapy. There have been reports of patients experiencing intense urges to gamble, increased sexual urges, and other intense urges, and the inability to control these urges while taking one or more of the medications that increase central dopaminergic tone and that are generally used for the treatment of Parkinson’s disease, including carbidopa and levodopa. Although it is not proven that the medications caused these events, these urges were reported to have stopped in some cases when the dose was reduced or the medication was stopped. Prescribers should ask patients about the development of new or increased gambling urges, sexual urges or other urges while being treated with carbidopa and levodopa. Patients should inform their physician if they experience new or increased gambling urges, increased sexual urges, or other intense urges while taking carbidopa and levodopa. Physicians should consider dose reduction or stopping the medication if a patient develops such urges while taking carbidopa and levodopa. Abnormalities in laboratory tests may include elevations of liver function tests such as alkaline phosphatase, SGOT (AST), SGPT (ALT), lactic dehydrogenase, and bilirubin. Abnormalities in blood urea nitrogen and positive Coombs test have also been reported. Commonly, levels of blood urea nitrogen, creatinine, and uric acid are lower during administration of this combination product than with levodopa. Carbidopa and levodopa may cause a false-positive reaction for urinary ketone bodies when a test tape is used for determination of ketonuria. This reaction will not be altered by boiling the urine specimen. False-negative tests may result with the use of glucose-oxidase methods of testing for glucosuria. Cases of falsely diagnosed pheochromocytoma in patients on carbidopa and levodopa therapy have been reported very rarely. Caution should be exercised when interpreting the plasma and urine levels of catecholamines and their metabolites in patients on levodopa or carbidopa and levodopa therapy. Caution should be exercised when the following drugs are administered concomitantly with carbidopa and levodopa. Symptomatic postural hypotension has occurred when carbidopa and levodopa was added to the treatment of a patient receiving antihypertensive drugs. Therefore, when therapy with carbidopa and levodopa is started, dosage adjustment of the antihypertensive drug may be required. For patients receiving MAO inhibitors (Type A or B), see CONTRAINDICATIONS. Concomitant therapy with selegiline and carbidopa and levodopa may be associated with severe orthostatic hypotension not attributable to carbidopa and levodopa alone (see CONTRAINDICATIONS). There have been rare reports of adverse reactions, including hypertension and dyskinesia, resulting from the concomitant use of tricyclic antidepressants and carbidopa and levodopa. Dopamine D2 receptor antagonists (e.g., phenothiazines, butyrophenones, risperidone) and isoniazid may reduce the therapeutic effects of levodopa. In addition, the beneficial effects of levodopa in Parkinson's disease have been reported to be reversed by phenytoin and papaverine. Patients taking these drugs with carbidopa and levodopa should be carefully observed for loss of therapeutic response. Pregnancy Category C: No teratogenic effects were observed in a study in mice receiving up to 20 times the maximum recommended human dose of carbidopa and levodopa. There was a decrease in the number of live pups delivered by rats receiving approximately two times the maximum recommended human dose of carbidopa and approximately five times the maximum recommended human dose of levodopa during organogenesis. Carbidopa and levodopa caused both visceral and skeletal malformations in rabbits at all doses and ratios of carbidopa/levodopa tested, which ranged from 10 times/5 times the maximum recommended human dose of carbidopa/levodopa to 20 times/10 times the maximum recommended human dose of carbidopa/levodopa. There are no adequate or well-controlled studies in pregnant women. It has been reported from individual cases that levodopa crosses the human placental barrier, enters the fetus, and is metabolized. Carbidopa concentrations in fetal tissue appeared to be minimal. Use of carbidopa and levodopa in women of childbearing potential requires that the anticipated benefits of the drug be weighed against possible hazards to mother and child. In a study of one nursing mother with Parkinson’s disease, excretion of levodopa in human breast milk was reported. Therefore, caution should be exercised when carbidopa and levodopa is administered to a nursing woman. The most common adverse reactions reported with carbidopa and levodopa have included dyskinesias, such as choreiform, dystonic, and other involuntary movements and nausea. Nervous System/Psychiatric: psychotic episodes including delusions, hallucinations, and paranoid ideation, neuroleptic malignant syndrome (see WARNINGS), bradykinetic episodes ("on-off' phenomenon), confusion, agitation, dizziness, somnolence, dream abnormalities including nightmares, insomnia, paresthesia, headache, depression with or without development of suicidal tendencies, dementia, pathological gambling, increased libido including hypersexuality, impulse control symptoms. Convulsions also have occurred; however, a causal relationship with carbidopa and levodopa has not been established. Nervous System/Psychiatric: ataxia, extrapyramidal disorder, falling, anxiety, gait abnormalities, nervousness, decreased mental acuity, memory impairment, disorientation, euphoria, blepharospasm (which may be taken as an early sign of excess dosage; consideration of dosage reduction may be made at this time), trismus, increased tremor, numbness, muscle twitching, activation of latent Horner's syndrome, peripheral neuropathy. Management of acute overdosage with carbidopa and levodopa is the same as management of acute overdosage with levodopa. Pyridoxine is not effective in reversing the actions of this product. General supportive measures should be employed, along with immediate gastric lavage. Intravenous fluids should be administered judiciously and an adequate airway maintained. Electrocardiographic monitoring should be instituted and the patient carefully observed for the development of arrhythmias; if required, appropriate antiarrhythmic therapy should be given. The possibility that the patient may have taken other drugs as well as carbidopa and levodopa tablets should be taken into consideration. To date, no experience has been reported with dialysis; hence, its value in overdosage is not known. Based on studies in which high doses of levodopa and/or carbidopa were administered, a significant proportion of rats and mice given single oral doses of levodopa of approximately 1500-2000 mg/kg are expected to die. A significant proportion of infant rats of both sexes are expected to die at a dose of 800 mg/kg. A significant proportion of rats are expected to die after treatment with similar doses of carbidopa. The addition of carbidopa in a 1:10 ratio with levodopa increases the dose at which a significant proportion of mice are expected to die to 3360 mg/kg. Usual Initial Dosage: Dosage is best initiated with one tablet of carbidopa and levodopa 25 mg/100 mg three times a day. This dosage schedule provides 75 mg of carbidopa per day. Dosage may be increased by one tablet every day or every other day, as necessary, until a dosage of eight tablets of carbidopa and levodopa 25 mg/100 mg a day is reached. If carbidopa and levodopa 10 mg/100 mg is used, dosage may be initiated with one tablet three or four times a day. However, this will not provide an adequate amount of carbidopa for many patients. Dosage may be increased by one tablet every day or every other day until a total of eight tablets (2 tablets q.i.d.) is reached. Maintenance: Therapy should be individualized and adjusted according to the desired therapeutic response. At least 70 to 100 mg of carbidopa per day should be provided. When a greater proportion of carbidopa is required, one 25 mg/100 mg tablet may be substituted for each 10 mg/100 mg tablet. When more levodopa is required, each 25 mg/250 mg tablet should be substituted for a 25 mg/100 mg tablet or a 10 mg/100 mg tablet. If necessary, the dosage of carbidopa and levodopa 25 mg/250 mg may be increased by one-half or one tablet every day or every other day to a maximum of eight tablets a day. Experience with total daily dosages of carbidopa greater than 200 mg is limited. 10 mg/100 mg — Each dark blue, mottled, round tablet imprinted with on one side and 538 and bisect on the other contains 10 mg of Carbidopa and 100 mg of Levodopa and is supplied in bottles of 100 (NDC 0228-2538-10) and 500 (NDC 0228-2538-50). 25 mg/100 mg — Each yellow, mottled, round tablet imprinted with on one side and 539 and bisect on the other contains 25 mg of Carbidopa and 100 mg of Levodopa and is supplied in bottles of 100 (NDC 0228-2539-10), 500 (NDC 0228-2539-50) and 1000 (NDC 0228-2539-96). 25 mg/250 mg — Each light blue, mottled, round tablet imprinted with on one side and 540 and bisect on the other contains 25 mg of Carbidopa and 250 mg of Levodopa and is supplied in bottles of 100 (NDC 0228-2540-10), 500 (NDC 0228-2540-50) and 1000 (NDC 0228-2540-96). Dispense in a well-closed, light-resistant container as defined in the USP.